From the Irmandade Santa Casa de Misericórdia de Porto Alegre, Universidade Federal de Ciências da Saúde de Porto Alegre (E.G.C.N., A.C., P.G.B., I.P.d.S. ); Movement Disorders Division, Irmandade Santa Casa de Misericórdia de Porto Alegre, Universidade Federal de Ciências da Saúde de Porto Alegre (C.R.M.R. ); and Neuroimmunology Division, Irmandade Santa Casa de Misericórdia de Porto Alegre, Universidade Federal de Ciências da Saúde de Porto Alegre (M.d.C.R.). 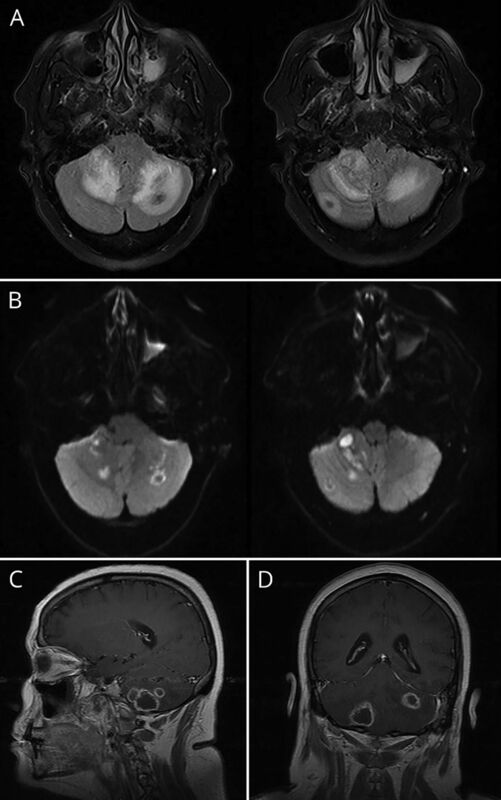 (A) Axial fluid-attenuated inversion-recovery images show perilesional edema in both cerebellar hemisphere and hypointense in the center of the lesions. (B) Axial diffusion-weighted image sequences show hyperintense and hypointense lesions with restricted diffusion of water molecules. Sagittal (C) and Coronal (D) T1-weighted sequences show peripheral hyperintense rim surrounding a hypointense center and ring enhancement after intravenous infusion of paramagnetic contrast. (A) CT of the thorax showed 3 nodular and micronodular lesions in the upper segment, one of the lesions with excavation, suggesting a granulomatous infectious process. (B) Nasofibrolaryngoscopy showing posterior laryngeal edema. Infiltrative lesions of both vocal folds with subglottic extension to the left, whose biopsy was compatible with paracoccidioidomycosis.